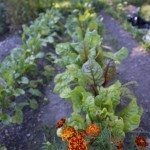 Companion planting is a modern term applied to an age old practice. American Indians certainly utilized companion planting when cultivating their vegetables. Among the myriad of companion plant options, planting garlic with tomatoes, as well as with other types of vegetables, holds a unique place. Can You Plant Garlic Near Tomatoes? Companion planting works by increasing plant diversity. Simply put, companion planting is alternating two or more types of veggies in a single row. This practice seeks to confound insects that tend to consume certain crops, leading them to move onto greener pastures, so to speak. This practice is also referred to as intercropping — that is combining plants that are desired by insects among those that are undesirable. The American Indians commonly intercropped three specific crops — corn, pole beans, and squash — called the Three Sisters method. This mutually advantageous planting system allows the beans to make use of the corn stalks to climb up, provides the corn nitrogen through the beans and the squash provides living mulch. There are many common combinations for companion planting. Some of these involve other vegetables or often flowers and herbs that repel insect marauders or attract pollinators. The answer to the above question is of course, you can plant garlic near tomatoes, but is there a benefit to such a companion planting? Strong smelling and tasting plants like onions and garlic are known to repel specific insect species. Growing tomato plants next to garlic repels spider mites known to ravage the tomato crop. It seems that while most of us love the pungent flavor and aroma of garlic, the insect world finds it less irresistible. Keep in mind, however, that not all plants in the garden coexist with garlic as readily as companion planting garlic with tomatoes. Veggies such as peas, beans, cabbage, and strawberries have abhorrence for garlic. You cannot only plant tomato plants next to garlic as a natural insecticide, but you can make your own garlic spray too. To make a garlic insecticidal spray, simply crush four cloves of garlic and steep them in a liter of water for several days. Pour this brew into a spray bottle for use as an insecticide, provided you are one of the many of us who love the smell of garlic. Read more articles about Garlic.